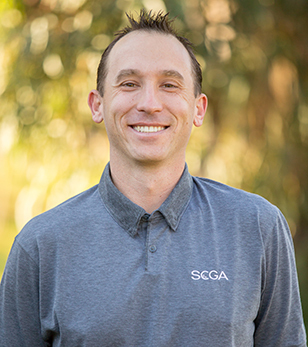 Since rejoining the SCGA in 2011 from the NCGA, Jimmy helps administer SCGA, CGA and USGA qualifiers/championships, and is featured in the Rules Crew video series, teaching the Rules of Golf to SCGA members and its clubs. Jimmy is also a member of a Rules & Competitions Department that annually scores some of the highest marks in the country on the USGA Rules of Golf exam at the USGA/PGA Rules workshops. He is a member of the U.S. Junior Amateur Championship Committee and works as a rules official at USGA Championships annually. A native Southern Californian, in his free time Jimmy enjoys hanging out with friends, playing sports and going to the beach. "Rule 20 – Lifting, Dropping and Placing; Playing From the Wrong Place. This is one of my favorites because there is so much involved in it, that once a player or official understands Rule 20, the rest of the Rules in the book make more sense." What has been your most memorable SCGA Tournament experience? "As an intern with the SCGA in 2004, I was running my first qualifier on my own (a 36-hole U.S. Amateur qualifier) and five players ended up being disqualified due to various rules incidents that day. Not exactly the easiest day, but one of the biggest and best learning experiences I have ever been a part of." Contact Jimmy Becker at: jbecker@scga.org.